Bam! Late again, ahhhhhhh. I was in a lot of pain. I still am! I don't know why. I spent most of my day stressing about it. Drawing helped! 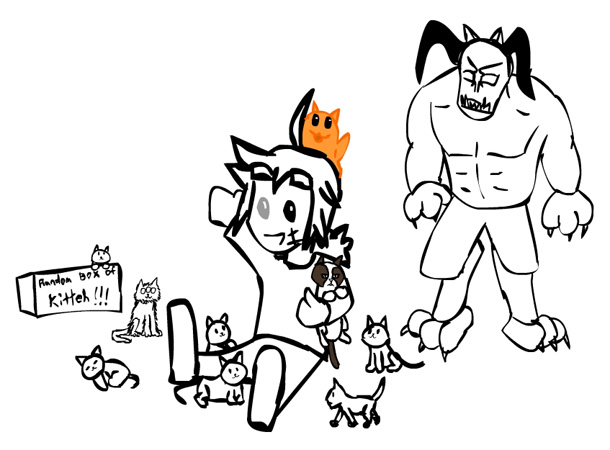 Hahahah, I should have known someone would draw Jeff with kitties! Not only did Hykez give him kitties, but unique ones! 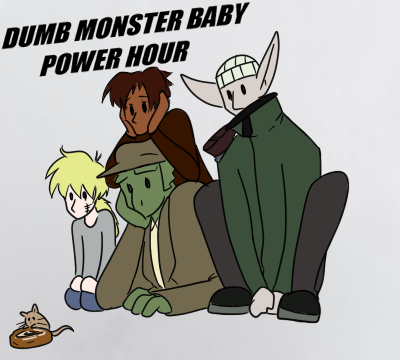 That big demon guy in the back is from the WA cameos in POWRITN! I laughed really, really hard at that, and at this for reminding me! BTW, are you going to celebrate a halfway to 300 comics? No worries; he has it in his backpack! Come on, Benjy! The octi doll! Use the octi doll! Definitely the bestest find regardless of what he ended up coming home with! I like how Ben reminds himself to breathe in the beginning. Oh no, he brought the wrong box, that can be stressful to go through just when he was trying to calm himself down at first. Is that some vintage old-age Coca Cola can he brought back? But perhaps there's a use for it. Aw, thank you, that's sweet! The pain went away as mysteriously as it came...What caused it? Will it be back? Where did it go? The Biscuit may never know...Hahahah. Seabiscuit... WHAT'S IN THE BOX? lol hope you're doing well! Find out...Soooooooooo- Ok the page'll be up in a few minutes, hah! Oh wow, I did NOT realise I was this behind on WA pages! @_@ Comment 'splode! !